I do think all the snow this week have been divine intervention in some ways. After the last couple of weeks exertions (market and teaching; all the preparation, frantic making and housework avoiding this entails) I've been quite spent. It was on my mind to keep my online shops on holiday and just take a week to regain some balance and deal with a bunch of little jobs and WIPs that have been lingering on the 'to do' list for far too long. 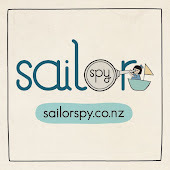 At the same time, I've come back from Wellington quite upbeat and full of new creative ideas for Sailor Spy and for The Wardrobe and part of me has wanted to throw myself into production. And not a moment too soon! Thank you 'Zan for humouring me and modelling your new mittens. Anyway, Lisa's goodies are winging their way to England, so now I can turn my attention to finishing up the Modern Quilt Bee blocks - for which I'm think I need a separate blog post, a crochet hat design for my best friend, a luscious knitted blanket. 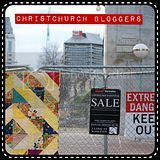 Oh and I'm considering signing up for Craft Invaders next month, the next Craft Collective markets...busy much? What are you doing to keep warm this week? You are so inspiring you busy lady!